The color, the aroma, the people, the music, the atmosphere … the farmers’ market is one of the rich, simple pleasures of living in the farm belt. In Monroe and surrounding counties, we have several farmers’ markets in which to shop for organic produce, free-range meats, eggs, coffee, tea, starter plants, flowers, handmade crafts, and much more. And on Saturday, one of the biggest in south-central Indiana begins: the Bloomington Community Farmers’ Market. In an age of factory farming and processed foods, it is more important than ever to know where your food comes from and how it is produced. Are toxic chemicals used on crops? Are organic methods employed in preparing and harvesting? Are animals treated humanely? More kinds of produce will be available as the weeks progress, but what we find at the market now has taken weeks and months of preparation by the farmers. 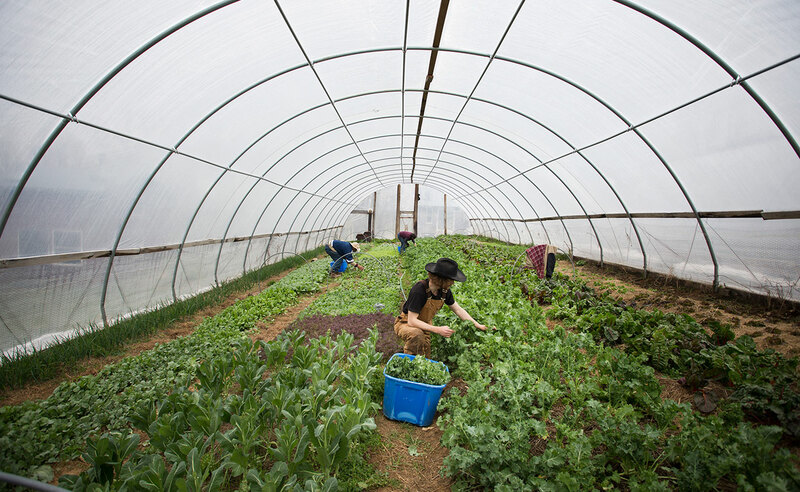 To give us a glimpse of where our most delectable food and other products come from, photographer Chaz Mottinger visited several local farmers and their farmsteads: Barnhouse Farms, which produces goat milk soap, organic microgreens, and free-range eggs; Linnea’s Greenhouse, which specializes in herbs, vegetable plants, succulents, house plants, perennials, annuals, native ferns, and many tropical plants; and Living Roots Farm and Sustainable Living Center, which sells a variety of vegetables, fruits, herbs and spices, free-range eggs, and grass-fed meats. Bloomington Community Farmers’ Market opens on Saturday in Showers Common, north of 7th Street between North Morton Street and the B-Line Trail. 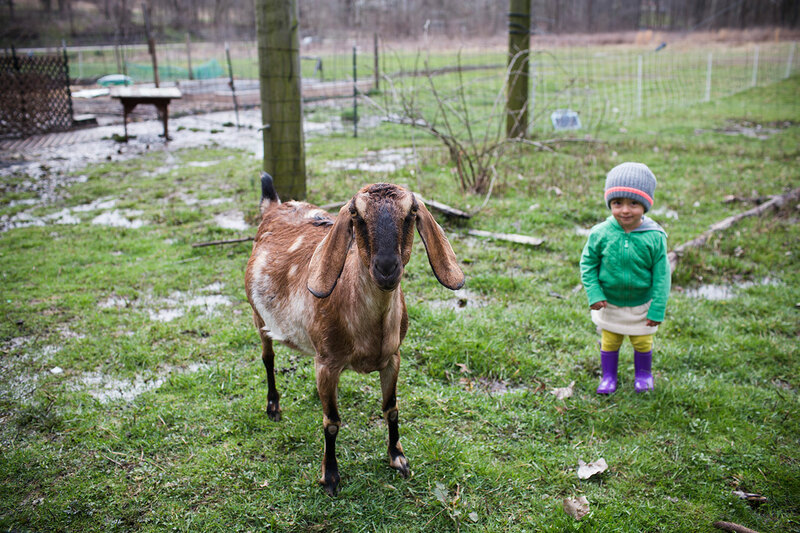 The McKinney family stands in a goat pasture at their home in Spencer, Indiana. 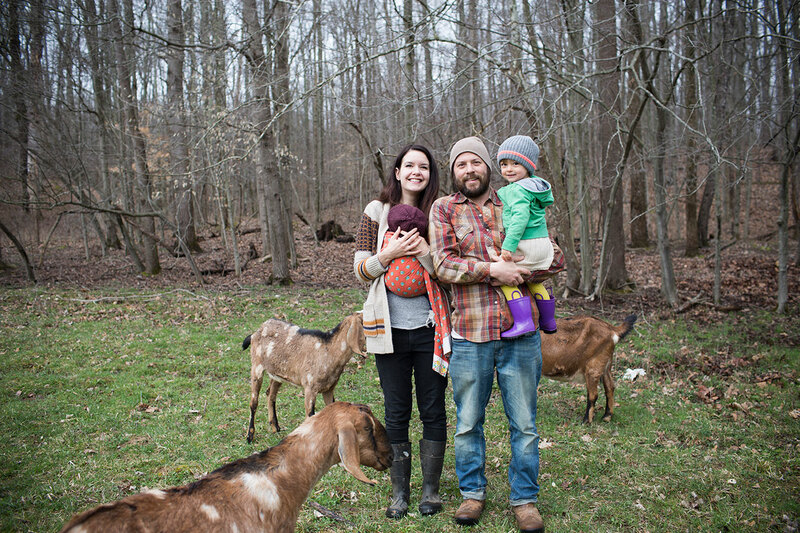 Husband and wife team, Sean and Chelssie, run Barnhouse Farms, which specializes in goat milk soap, organic microgreens, and free-range eggs. They sell most of their goods at the Bloomington Community Farmers’ Market, and the rest supplies restaurants and stores. 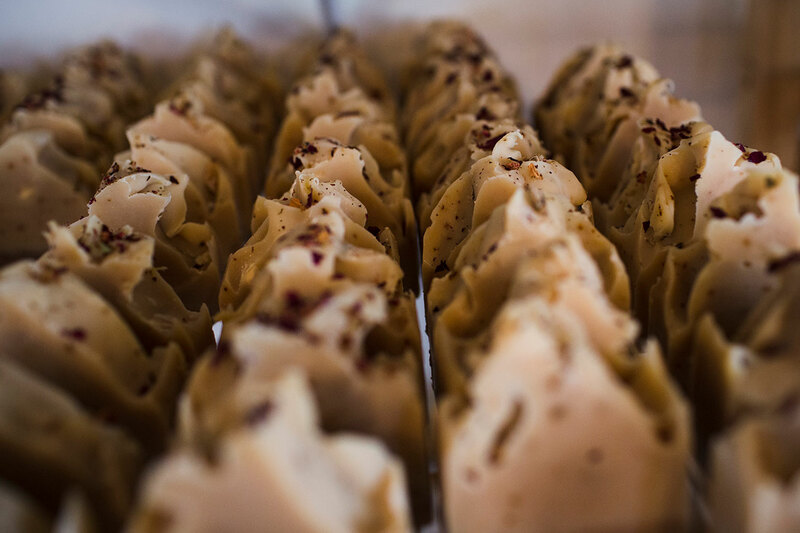 An array of “Hustle Rose” goat milk soap sits on the shelf at Barnhouse Farms’ soap workshop, right outside of their home. Chelssie has been soap making for nearly four years, and they are entering their third season at the market. The botanical bits on top of the soap are grown organically by the farm — even the coloring comes from their own produce, like carrots and spinach. A soap cutter, made with guitar strings, is seen on the workshop’s counter. 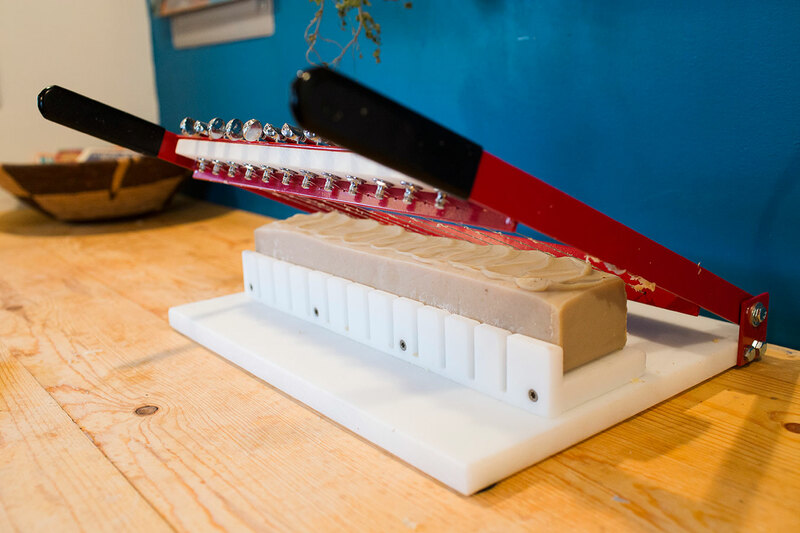 Sean makes soap molds out of raw pine; one batch makes 14 bars of soap. Soap-making supplies include essential oils, botanicals like mint and red clover, and frozen purées and goat milk. 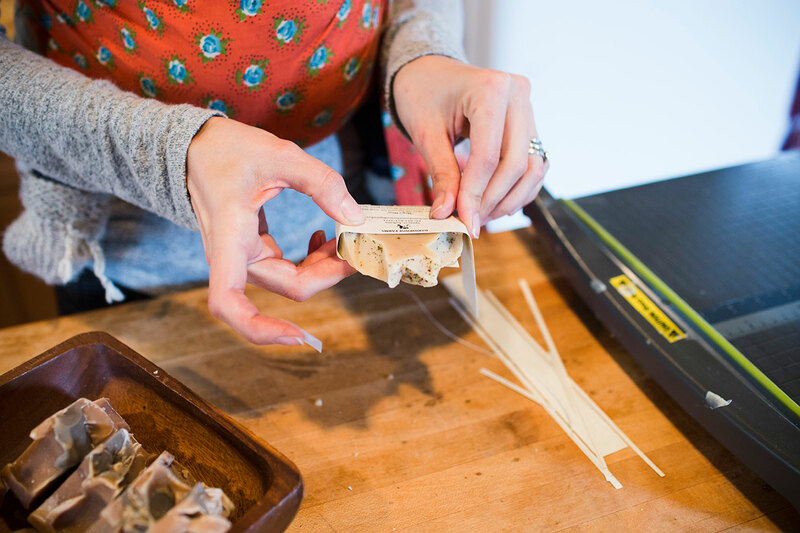 “Goat’s milk will burn as you make (the soap) if you don’t freeze the cubes first,” Chelssie says. A labeled bar of “Nag Champa” soap sits on the counter in Chelssie’s workshop. Another reason for soap making was Chelssie’s sensitive skin, a trait she passed on to her two-year-old daughter, Esmé. Soap made from raw, fresh goat milk is beneficial and moisturizing for those with skin sensitivity or conditions like eczema. 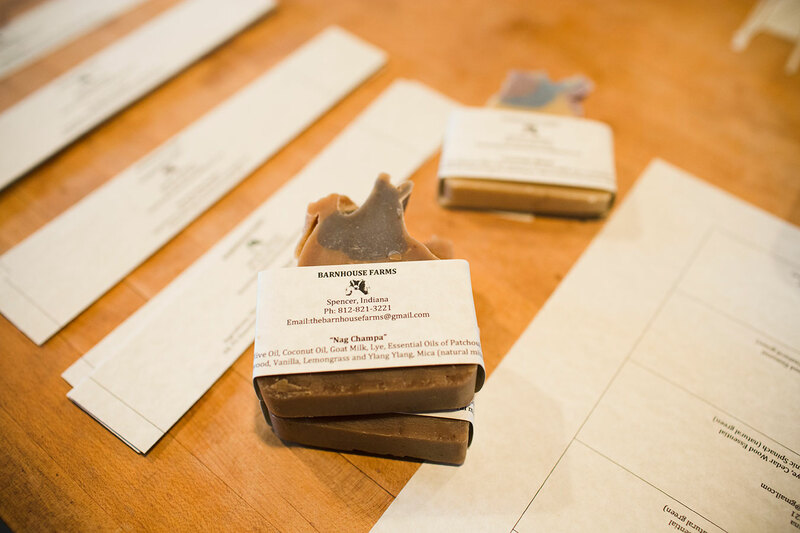 Chelssie labels the soap by hand in her workshop. 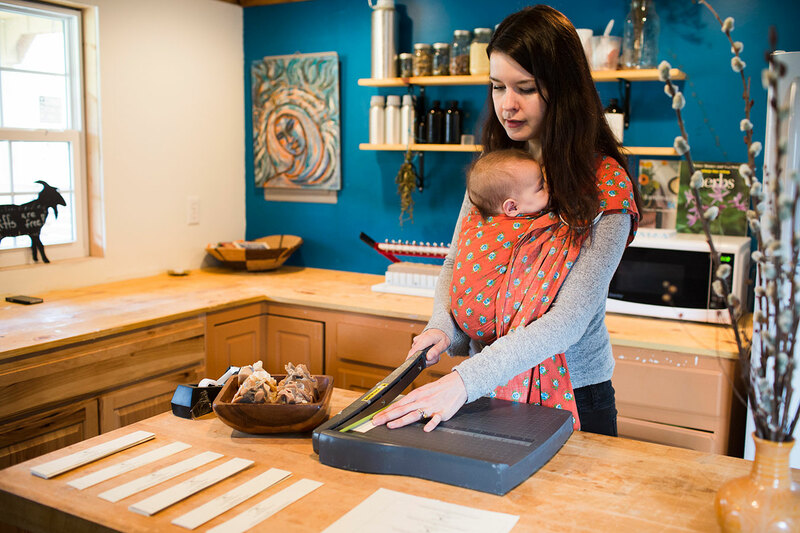 “The one awesome thing about labeling everything by hand — nothing gets past you; there’s more attention to quality,” says Chelssie. To show off the design of the soap, the recycled paper she uses for the labels wraps around only the bottom part of the soap. Trays of microgreens line the upstairs of the soap workshop. While Chelssie is the soap maker, Sean is the primary grower of microgreens and heirloom vegetables that they also sell at the farmers’ market. 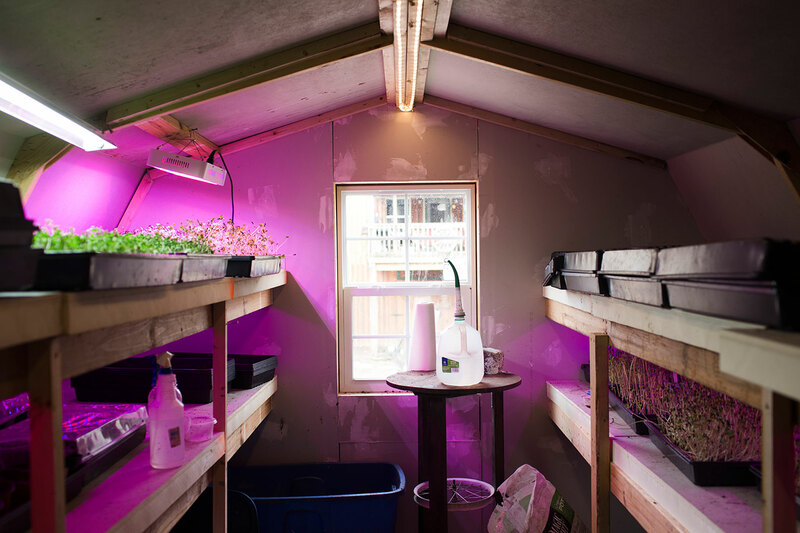 Because of the cold and uncooperative winter, they had to move the microgreens from their passive solar-powered and naturally lit sunroom into a new setup. 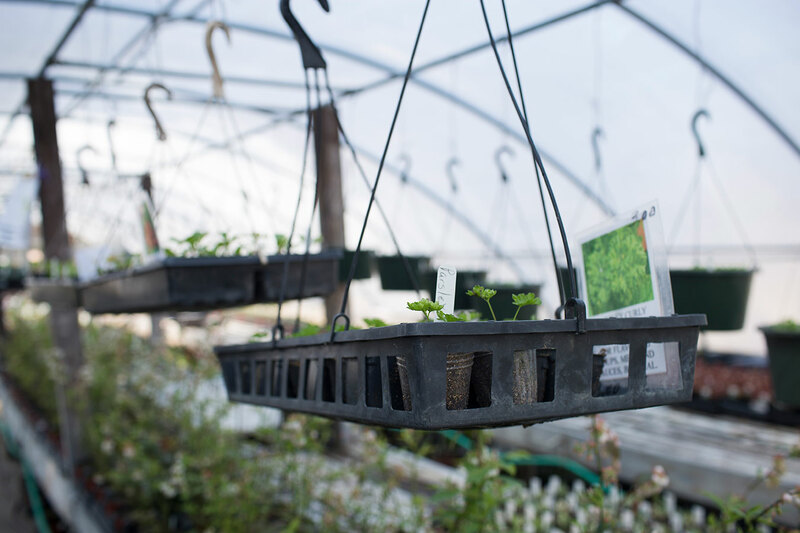 They usually have about 70 trays of microgreens at once — a number that might double this year. Linnea Good poses in her greenhouse in Unionville. 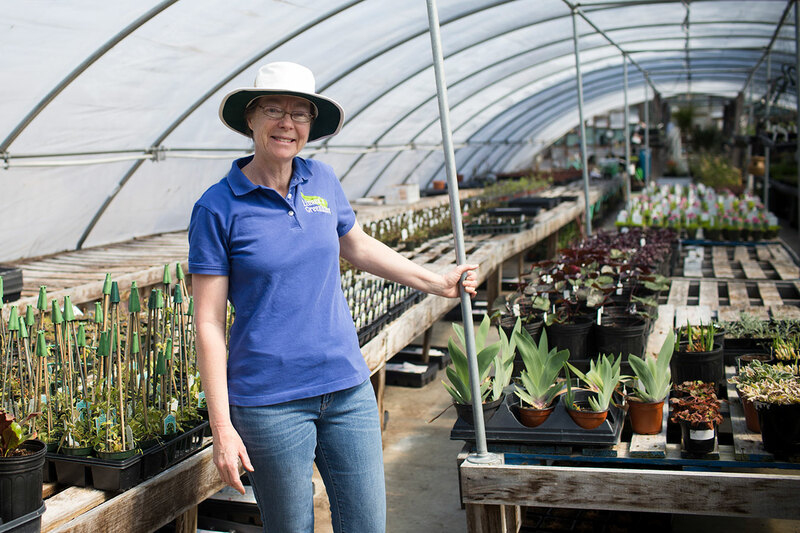 Along with her husband, she runs Linnea’s Greenhouse, which specializes in herbs, vegetable plants, succulents, house plants, perennials, annuals, native ferns, and many tropical plants. They’ve been part of the Bloomington Community Farmers’ Market since 1996. 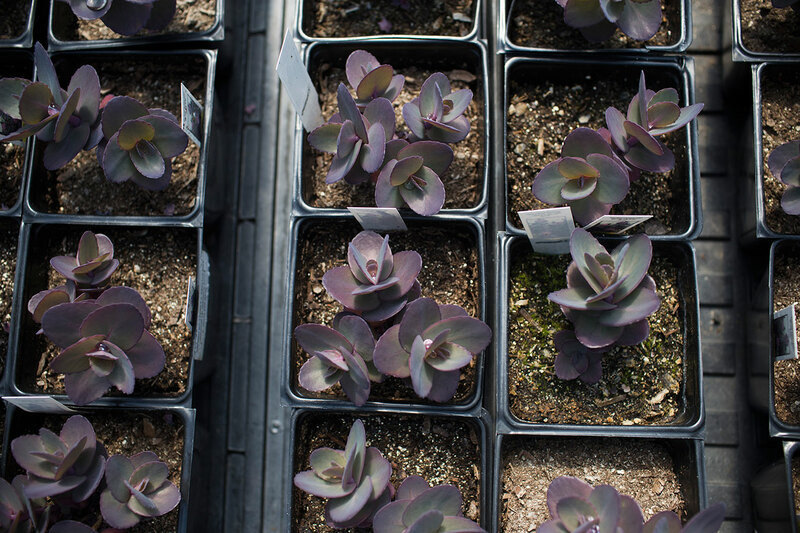 Blue pearl sedum, a type of succulent, sits in Linnea’s greenhouse. 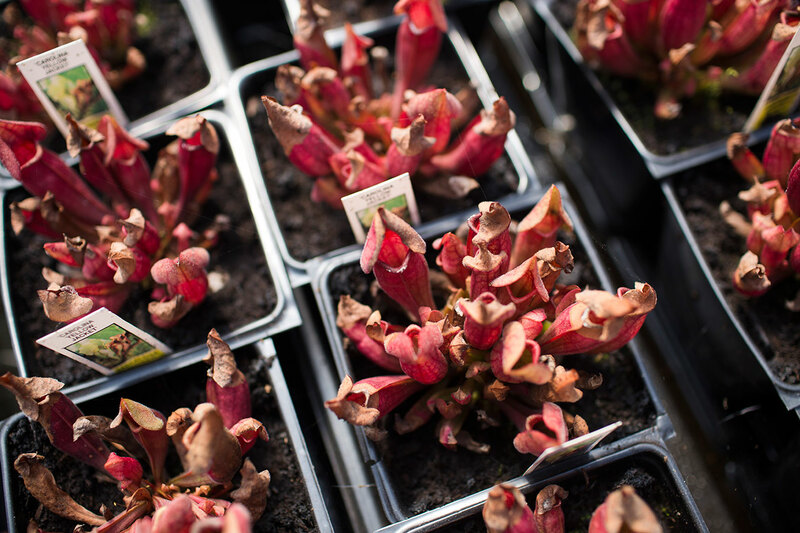 Overall, succulents and carnivorous plants are the biggest seller, but perennials take the number one spot in April and May. Linnea spends March timing and prepping plants to make sure she has enough full flats to last her through May. “You realize the changes that the plants have to go through to survive the winter,” Linnea says. 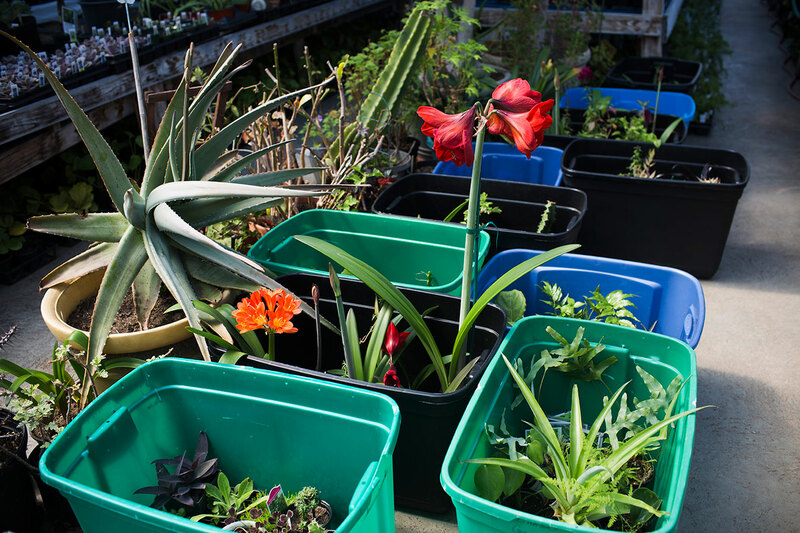 Bins full of plants that will be brought to market lie on the floor of the greenhouse. 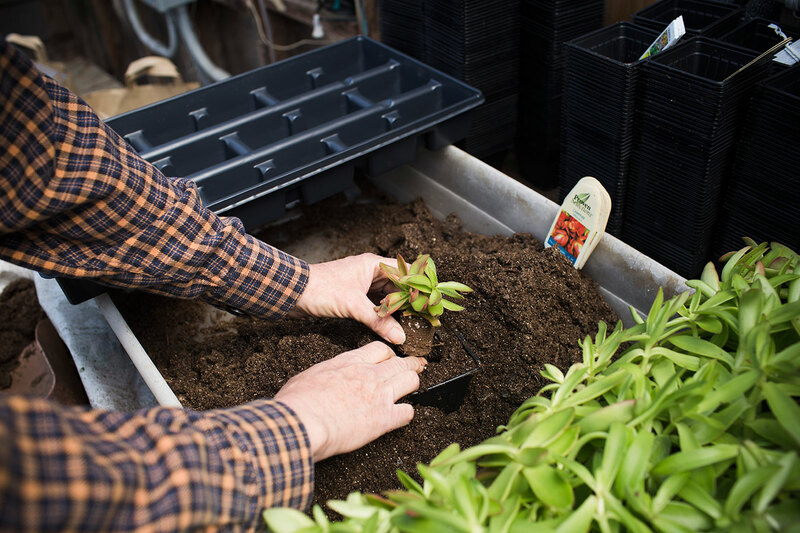 Linnea will take her hardiest plants to the early-spring market when she expects the morning temperatures to be below freezing. 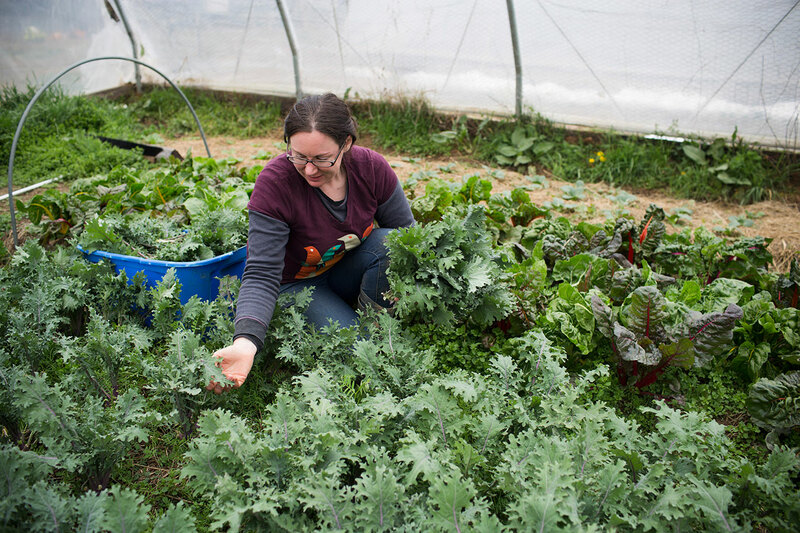 It’s hard to take much in such cold weather, but she usually brings hardy perennials and cold crops — veggie plants that can take the cold — to start off the outdoor market season. 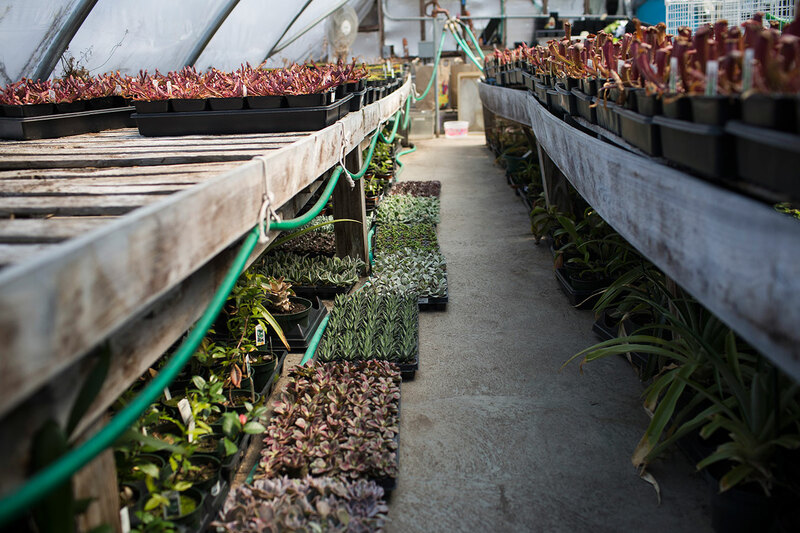 Trays of succulents line the floor of the greenhouse to stay warm. A nearby boiler, fueled by wood, pumps hot water underneath to heat the floor of the greenhouse in the winter. “As long as you can keep the plant root warm, the rest of the plant will survive,” Linnea says. She will eventually move plants from the ground to the tables for better sunlight. A type of carnivorous pitcher plant called Carolina Yellow Jacket soaks up some sun in the greenhouse. 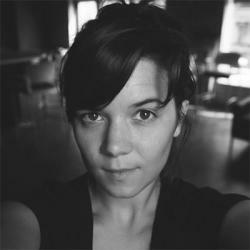 “I was actually feeding (the pitcher plants) the ants that are in my soil,” Linnea says. “Take a pair of tweezers, grab the ant, and put them wherever there’s an open mouth.” Like this pitcher plant, some plants have brown edges or turn red as a response to the cold, then they turn green when the weather warms up and they get more sunlight. 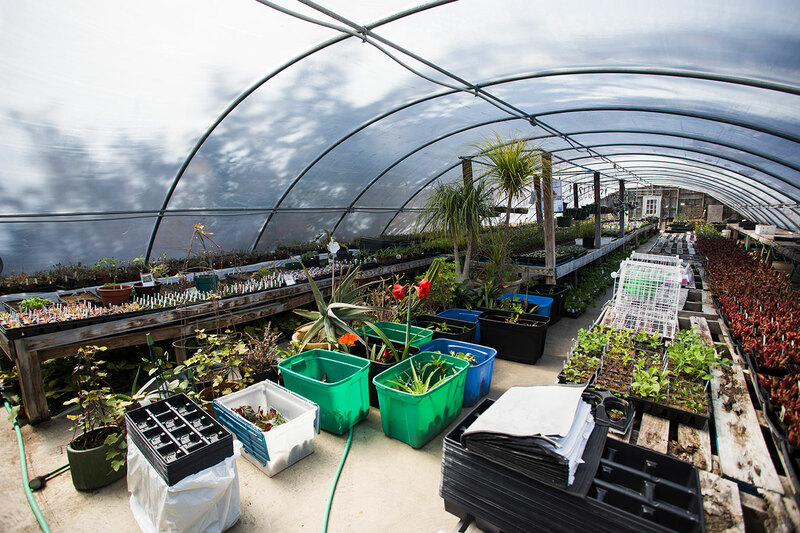 A view of Linnea’s 96-by-30-foot greenhouse on a sunny day. In addition to socializing with customers and fellow growers, Linnea likes “seeing the community come out and support us” at the farmers’ market. She’s had the same two-car parking space since about 1999, with an abundance of plants atop tables, mimicking her greenhouse setup. 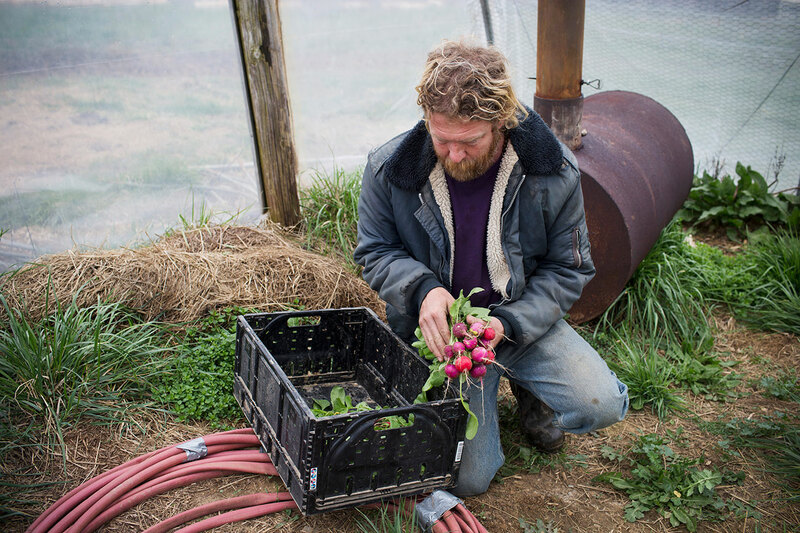 Michael Hicks, owner and founder of Living Roots Farm and Sustainable Living Center, looks over freshly picked radishes at his farm in French Lick. The farm has been with the outdoor Bloomington Community Farmers’ Market since 2005, selling vegetables, fruits, herbs and spices, free-range eggs, and grass-fed meats. 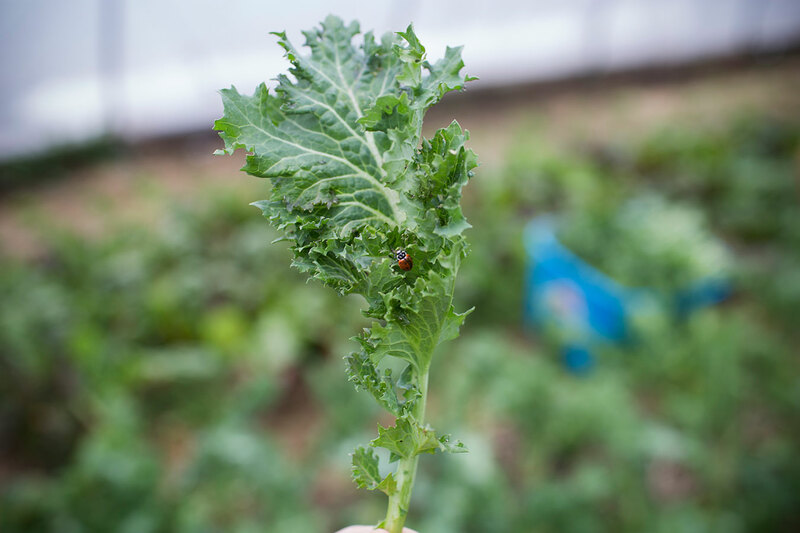 A ladybug crawls on a kale leaf inside one of the greenhouses. Since Living Roots is a chemical-free farm, insects like ladybugs provide the biological control — an environmentally friendly way to reduce pests through natural enemies. One of the more popular choices of this method, ladybugs (coccinellidae) consume aphids and other pests that would ruin the plants. 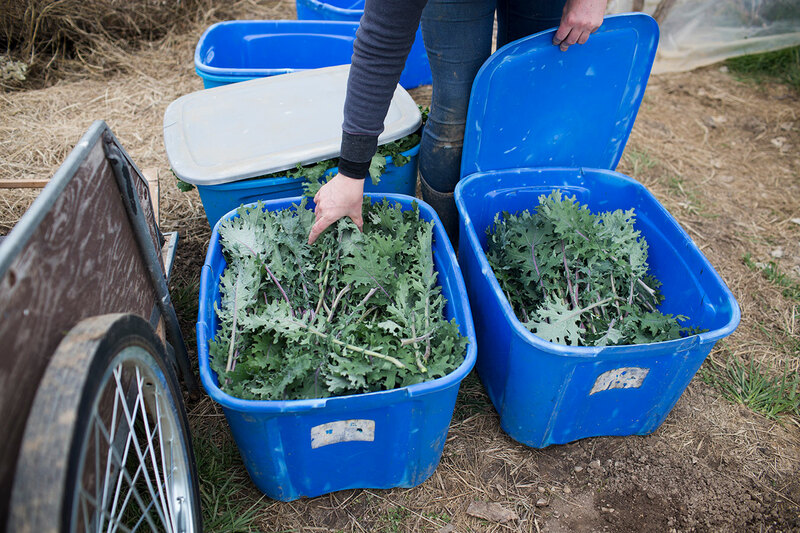 Desiré places freshly picked kale into bins. For this first outdoor market, Michael says they have a lot of produce, despite the cold weather, including leafy greens, cilantro, green onions, and grass-fed beef. They’ll also offer free-range eggs and lamb, which are new this year. Michael says they always want to bring more diversity to the market. 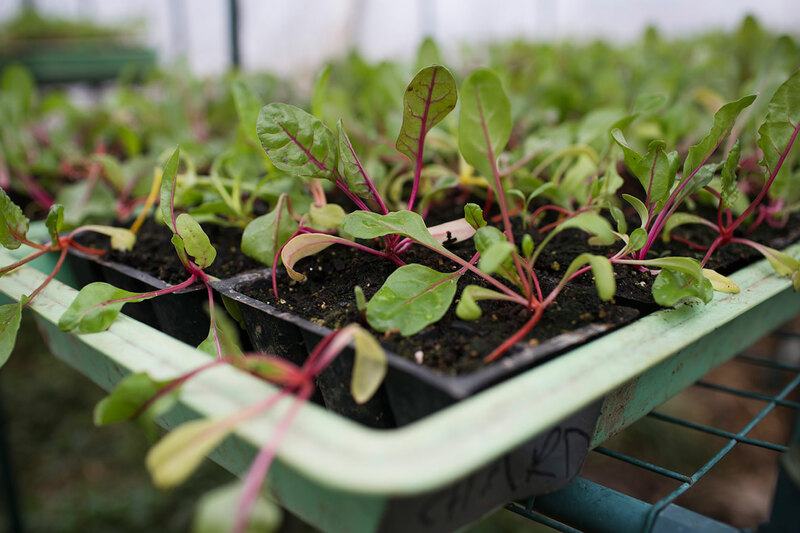 Chard grows in one of Living Roots’s greenhouses. 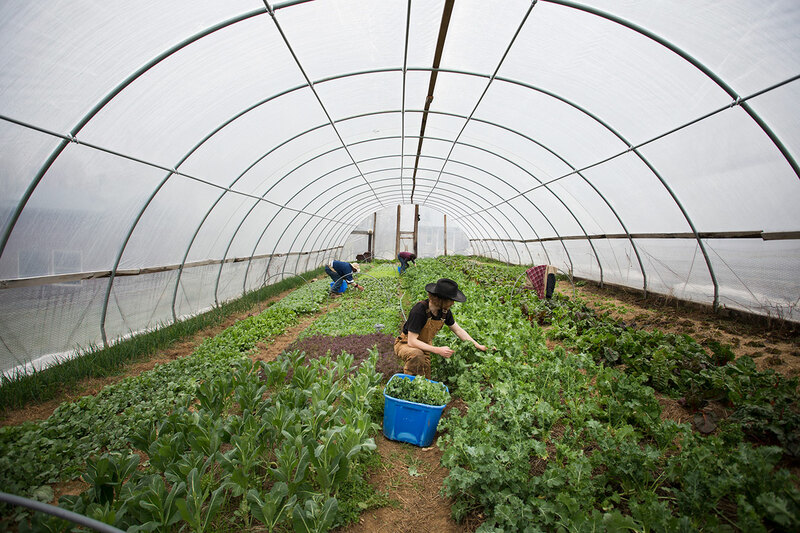 Three greenhouses and a couple of barns are located on the 75-acre sustainable farm. 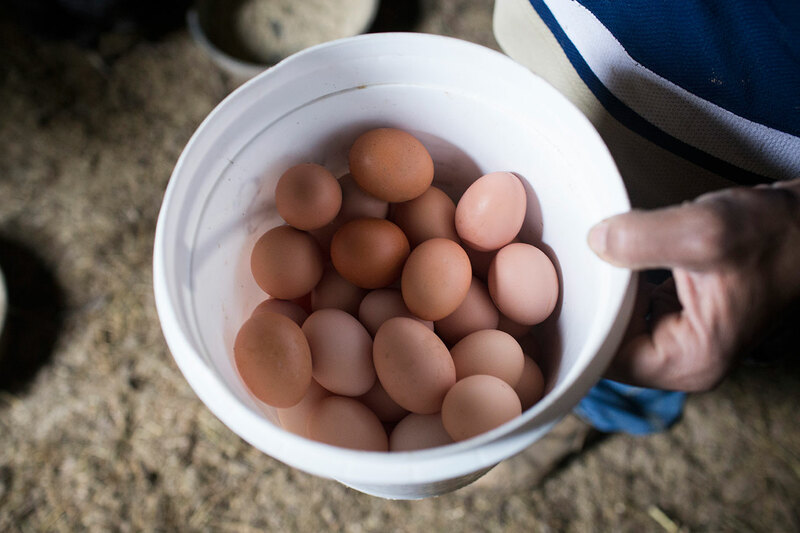 Farm worker Terrence Jackson shows the eggs he just picked in the chicken coop. They harvest about 70 eggs a day and that number can rise to 90 or 100. The farm also has goats and pigs. Farm workers Joe Lekowski, Desiré Moore, and Terrence Jackson pick produce — kales and radishes — in one of the greenhouses at Living Roots. “I’m always excited about the first outdoor Saturday market because it’s a feeling of spring and there’s a lot of new vegetables,” Michael says.